Do you work at The Metropolitan? Ground floor beer garden and first floor roof terrace. What did you think of The Metropolitan? If this is The Metropolitan that everyone used to go on about when All Saints were popular (i.e. a really long time ago now), it’s rubbish. It’s appallingly expensive, there are no famous people there, and everyone is rude. The Metropolitan is just like All Saints – so over. The Metropolitan is my local. I like the pub. Food unfortunately can be a bit hit and miss. They really need a new chef to make it consistent. Otherwise, I love it. I love the metropolitan. I lived up the road from it for a bit and I miss it now i am not there. The staff were all ace and I had some great nights meeting new people at The Metropolitan and equally awesome nights romancing with my fella over a great meal. The Metropolitan is a brilliant pub with even better staff. Friendly, fast and good-looking - what more can you ask for? Sundays are the nuts - a definite must if you're in the area! I ate in the private dining room with a group of friends last week and we all agreed it is just what this area has been looking for. It is seriously like dining round at somebody's house. In the summer they even have a roof terrace seating 24! 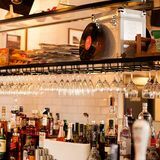 Practically on the doorstep of Westbourne Park tube, this laid-back gastro pub boasts both a lively nightlife with talented DJs and a loyal base of locals who come for the sports channel and stay for the beer. 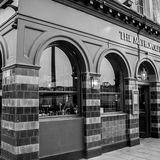 The most obvious thing The Metropolitan has going for it is location; just a few footsteps away from Westbourne Park station, it couldn’t be easier to find and it’s perfect for a quick after work drink before sliding into your slippers. Sitting in a fairly quiet spot on the corner of Great Western Road, it looks thoroughly modern and stylish from the outside, painted head to toe in black with a cute, simple steam train motif as its logo. Inside, the décor is eclectic and quirky – at least ten huge, old-fashioned lampshades just might remind you of sitting in your granny’s living room - though it does feel a little dated and perhaps in need of a lick of paint. 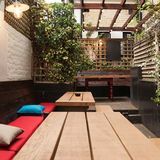 The pub is bright and airy but quite small and dominated by a huge central bar, which actually makes the space feel more intimate and inviting, and there’s a small, pretty beer garden and roof terrace. There’s a very chilled vibe in here during the day and in fact, the place is almost empty before the workday is over. Pop inside on a weekday afternoon and expect to be met with a spattering of middle-aged locals who all seem to know each other – and are often making use of the TV showing live sport every day – while outside on a sunny day there’s often a younger crowd. The staff are friendly and happy to have a chat with punters, and the background music – a soundtrack of 50’s rock ‘n’ roll and soul – lends the pub a more edgy vibe than you’d expect from the area. Weekends and evenings get a lot busier, especially when there’s a DJ on from 7.30pm, so you’ll want to get in early and nab a seat. 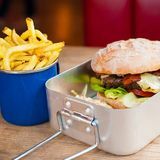 There’s an impressively varied menu available and food is served up gastro pub-style with rustic presentation and generous portions. At lunch - served Tuesday to Friday – though there’s just one dessert (apple crumble), you can get a whole host of different cuisines: Greek (a £10.75 mezze with pitta, hummus and all the usual trimmings), Asian (Japanese prawn tapas for £4.25) and British (pigs in blankets, £4.24 and haddock and chips, £7.50). The dinner menu is much the same with a few small additions including an extra dessert (chocolate brownie, £5.25). On Mondays and Tuesdays you can enjoy 2-for-1 burgers, too. A 175ml glass of house white wine (Catini Bianco) or red (Shiraz) goes for £4.10. On draught you’ll find all the usual suspects like Aspall, Guinness, Heineken, Estrella, Amstel and Kronenbourg, starting around the £3 mark. The Metropolitan has a lot to offer, whether you’re up for a wild night out or a quiet afternoon pint. With an affordable, tasty menu (don’t forget those 2-for-1 burgers!) and a decent selection of draught and bottled beers, it’s easy to while away the hours here until home time.